In their hunt for an NCAA tournament ticket, the University of Utah men’s tennis team (13-5, 1-2 Pac-12) did themselves a huge favor by beating No. 27 Oregon (14-4, 0-3 Pac-12), 4-2, in Eugene, Oregon for their first Pac-12 win of the season. Since joining the Pac-12, the Utes are now 4-1 over the Ducks, having won the last four consecutive meetings between the two teams. Utah started the day off slow, losing the doubles point and Daniel Sardu put the Oregon Ducks up 2-0 after beating Cedric Willems in straight sets. But, the Utes battled hard and evened the score with wins by Devin Lane and Slim Hamza. With the score tied, the remaining three matches went back and forth, all three of them going three sets. 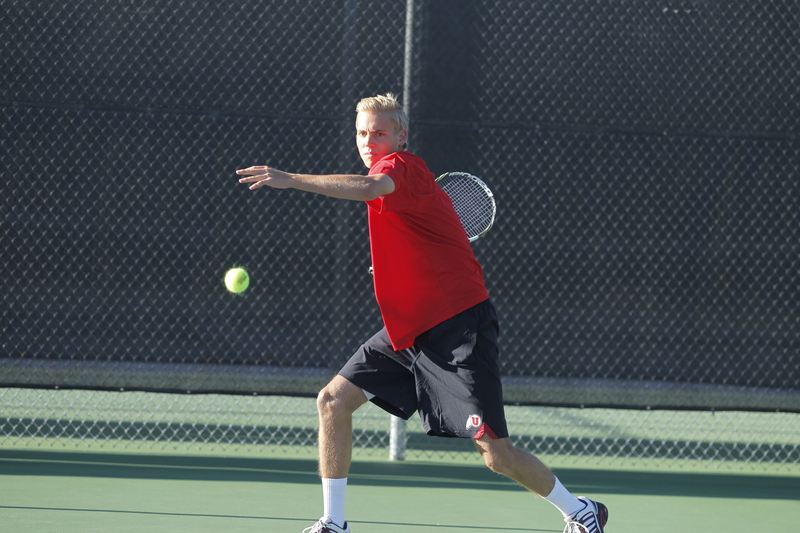 Ben Tasevac eventually put Utah up 3-2, with a 6-7(5), 7-6(5), 6-4 victory at No. 2 singles and Matt Cowley clinched the win for the Utes with his first ever Pac-12 singles win, beating Jayson Amos 6-4, 6-7(4), 7-6(5). The Utes will travel to Seattle, Washington tomorrow to face the University of Washington on Sunday at 11am. This entry was posted in Schedule/Results and tagged Alejandro Medinilla, Ben Tasevac, Cedric Willems, Devin Lane, Ducks, FD Robbins, Matt Cowley, Oregon, Pac-12, Roeland Brateanu, Slim Hamza. Bookmark the permalink.